The Happy Hollisters Book Club! 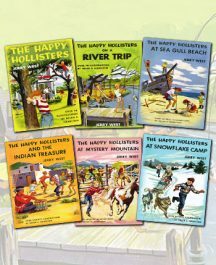 The Trading Post Store is your source for reissued Happy Hollisters books and t-shirts! Plus you’ll receive FREE SHIPPING on all standard orders shipped within the USA. See products and details below. All major credit cards are accepted. Every order also includes FREE Collector’s Edition Happy Hollisters bookmarks as our thanks. 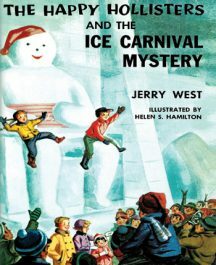 As an added bonus, please tell us the name of the child (or children) who will be receiving the books and we’ll add a personal note from JERRY WEST. Simply tell us their names in the order notes section at checkout, and we’ll take it from there! Thank you for your order and support of The Happy Hollisters! Exciting news! We’re thrilled to bring you this first-ever Happy Hollisters Super Bundle set of all paperback titles currently in publication. That’s 29 books for one great price with FREE shipping! Please scroll down this page for more details! Free shipping offer good for USA addresses only. 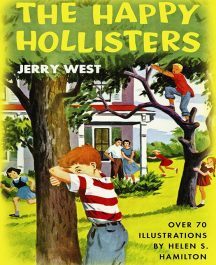 The Happy Hollisters’ exclusive 3-Book Starter Set. 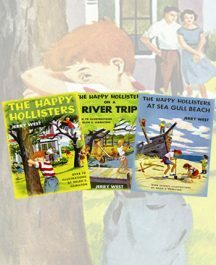 The adventure begins with volume 1, The Happy Hollisters, followed by volume 2, The Happy Hollisters on a River Trip, and volume 3, The Happy Hollisters at Sea Gull Beach. Includes FREE Shipping to addresses in the USA! Save over 25% on this exclusive Happy Hollisters 10-Book Starter Set. Order the first ten volumes in the series for your ambitious young reader. Receive Free Shipping in the USA! Save over 15% with The Happy Hollisters’ exclusive 3-Book Winter Break Collection. 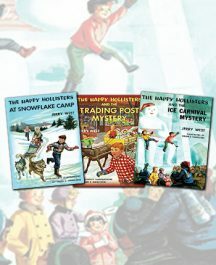 Bundle up in ear muffs, snow boots, mittens, and heavy coasts to join the Hollister children in three exciting stories including The Happy Hollisters at Snowflake Camp, The Happy Hollisters and the Trading Post Mystery, and The Happy Hollisters and the Ice Carnival Mystery. Includes FREE Shipping to addresses in the USA! 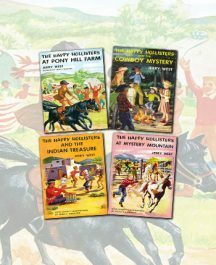 Save over 15% with The Happy Hollisters’ exclusive 4-Book Horse Lovers/Western Collection. 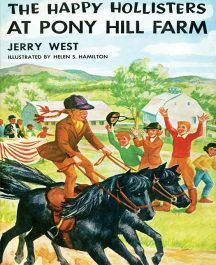 Saddle up and look for clues in four exciting stories including The Happy Hollisters at Pony Hill Farm, The Happy Hollisters and the Cowboy Mystery, The Happy Hollisters and the Indian Treasure, and The Happy Hollisters at Mystery Mountain. 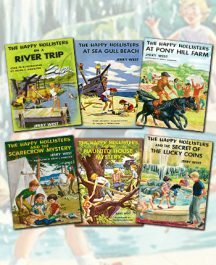 Save over 20% with The Happy Hollisters’ exclusive 6-Book Starter Set. 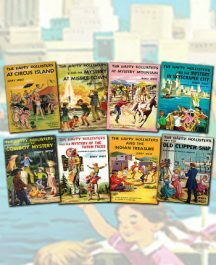 The adventure begins with volume 1, The Happy Hollisters; followed by volume 2, The Happy Hollisters on a River Trip; volume 3, The Happy Hollisters at Sea Gull Beach; volume 4, The Happy Hollisters and the Indian Treasure; volume 5, The Happy Hollisters at Mystery Mountain; and volume 6, The Happy Hollisters at Snowflake Camp. Armchair travel the USA and save over 20% with The Happy Hollisters’ exclusive 8-Book “Travel the USA” Collection. 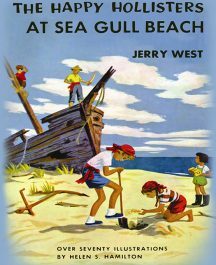 Join the Hollister children as they solve mysteries in U.S. states such as New Mexico, Florida, Nevada, Massachusetts, New York, and Alaska. 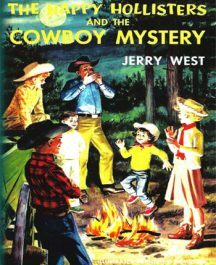 Your curious young reader will enjoy eight exciting stories including The Happy Hollisters at Circus Island, The Happy Hollisters and the Mystery at Missile Town, The Happy Hollisters at Mystery Mountain, The Happy Hollisters and the Mystery in Skyscraper City, The Happy Hollisters and the Cowboy Mystery, The Happy Hollisters and the Mystery of the Totem Faces, The Happy Hollisters and the Indian Treasure, and The Happy Hollisters and the Old Clipper Ship. 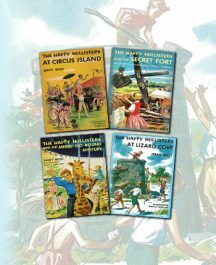 Save over 15% with The Happy Hollisters’ exclusive 4-Book Spring Break Collection. 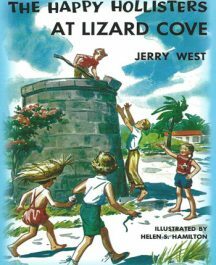 Step outside into the warming air to join the Hollister children in four exciting action-adventure mystery stories including The Happy Hollisters at Circus Island, The Happy Hollisters and the Secret Fort, The Happy Hollisters and the Merry-Go-Round Mystery, and The Happy Hollisters at Lizard Cove. Save over 20% with The Happy Hollisters’ exclusive Summer Vacation Collection. Summer is a swell season for outdoor fun and adventures. 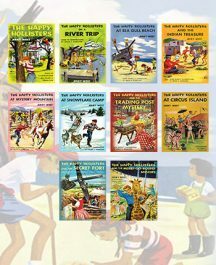 When your kids need to come inside and cool off, give them a treat with these six exciting summertime action-adventure mystery stories including The Happy Hollisters on a River Trip, The Happy Hollisters at Sea Gull Beach, The Happy Hollisters at Pony Hill Farm, The Happy Hollisters and the Scarecrow Mystery, The Happy Hollisters and the Haunted House Mystery, and The Happy Hollisters and the Secret of the Lucky Coins. The adventures begin when the Happy Hollisters move into their new house in Shoreham, but the moving van carrying their toys disappears. 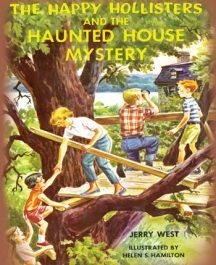 Then they learn that their house may be haunted, with a treasure hidden somewhere inside! A fishing contest at The Trading Post, Mr. Hollister’s sporting goods store, has everybody in Shoreham excited. 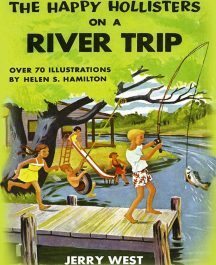 After Pete catches a large fish with a mysterious tag on its tail, another adventure begins for the eager young detectives. The Happy Hollisters are looking forward to vacationing at Sea Gull Beach with their cousins. Then they discover that the lighthouse lamp they received as a gift from Uncle Russ contains a tiny treasure, and are even more eager to get to join their relatives and search for the rest of the treasure. Mr. Hollister plans a trip to New Mexico to purchase SW Indian trinkets to sell at The Trading Post. 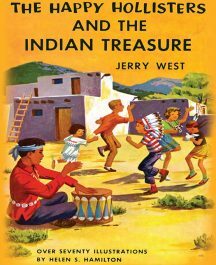 When a family friend and Yumatan Indian Indy Roades tells them of his tribe’s lost turquoise mine, Mr. Hollister brings the whole family along to help locate the lost gems. The Happy Hollisters are invited to stay on a ranch in New Mexico and discover a map leading to the cave of ancient dollmakers, the long-lost buried secret of the mountain. The Happy Hollisters help find the lost cave and discover a sheep rustling ring in this fast-moving story. 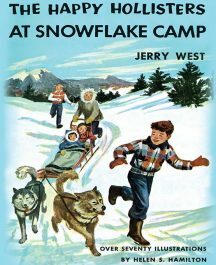 The Happy Hollisters head to Canada to visit their grandparents for the yearly Trappers’ Carnival and end up joining the search for a missing dog trainer and some valuable Eskimo puppies. In addition to solving the mystery, they have great fun learning to ski and drive a dog sled. There is great activity in the Hollister household upon the arrival of Domingo, the donkey promised Sue by friends in New Mexico. The excitement mounts higher with the discovery of a note attached to the donkey’s halter signed “Y.I.F.” So begins one of the two mysteries that run through this book. 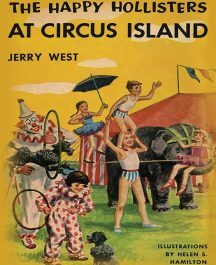 A trip to Circus Island in Florida in search of a houseboat to purchase puts the Happy Hollisters on the trail of circus dog thieves. 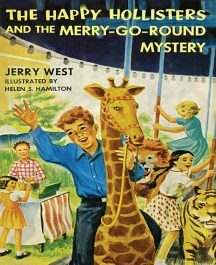 As the young sleuths uncover sinister goings-on behind the scenes at the circus, they also learn exciting circus tricks like tumbling and tight-rope walking. 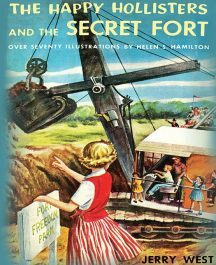 A missing letter is the key to the whereabouts of Fort Freedom, the stockade that disappeared after the Revolutionary War. The fort is located somewhere within the boundaries of Shoreham and has been sought after for many years, not only for its historic value, but for the gold supposed to be hidden there by the early settlers. Pete Hollister volunteers to locate a merry-go-round for the Lincoln School fair. Disappointments abound when a gear for the apparatus is apparently lost and a vandal sets fire to the booths and decorations in attempt to ruin the event. 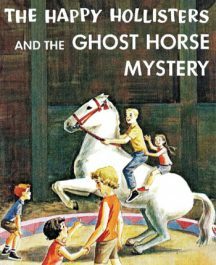 The Happy Hollisters are surprised to learn that a hobbyhorse they purchased at an auction holds the key to settling an inheritance that will change the future for their new friend, Graham Stone. The mystery deepens with the appearance of a beautiful appaloosa pony, seemingly out of nowhere. A rain storm and an unexpected guest bring new mysteries to Shoreham, along with film stars Gregory Grant and Lisa Sarno. 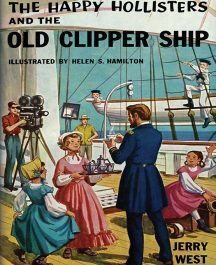 The Happy Hollisters are invited to perform in a film about clipper ships as they search for clues. The arrival of a crate of pineapples and an odd pet at the Hollister home leads the family on a Puerto Rican vacation. A stone found on a sightseeing tour then proves to be a clue to a pirate’s treasure. The children have fun learning new customs and a new language as they comb the island for clues. 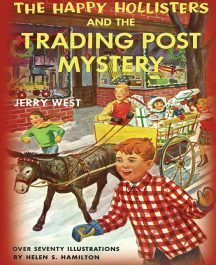 When Mr. Hollister’s sport and toy store, The Trading Post, is robbed, his main concern is for his invention, a new type of collapsible canoe. He is therefore surprised to discover that a Geiger counter and a couple of pickaxes are the only missing items. This story finds the Hollister family off to Alaska with Uncle Russ and their two cousins, Teddy and Jean. Russ Hollister, a commercial artist and cartoonist, has run out of ideas and is trying to think of a new location for his comic strip characters. A visit from Gram and Gramp Hollister in the Hollister home at Shoreham opens up the opportunity for the five children to go to Canada with their grandparents to see the Mardi Gras and Winter Carnival in Quebec. A mysterious Chinese message tucked inside a book about New York City tunnels leads the Happy Hollisters to Chinatown in search of a long-lost treasure. 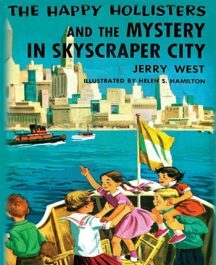 While Mr. Hollister works with a toy manufacturer to perfect a new invention, the rest of the family explores New York City and learns about the Chinese way of life in Manhattan. On their first adventure outside of the Western Hemisphere, the Happy Hollisters travel to Denmark for their summer vacation. 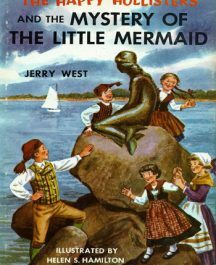 During the flight to Copenhagen, the children meet a member of the Danish royal family’s staff who is carrying a valuable reproduction of the “Little Mermaid,” the famous statue that overlooks the harbor in Copenhagen. Upon landing in Denmark, the figurine goes missing, and the sleuthing begins! The Happy Hollisters arrive in Florida to visit their cousins and Uncle Walt, a rocket expert at Patrick Air Force Base. 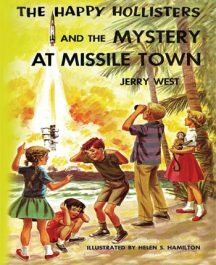 They are immediately caught up in a mystery when an unmanned missile explodes and the rocket’s valuable nose cone is lost in the ocean. The Hollisters race against time—and a villainous band of treasure hunters—to see who will find the missing payload first. 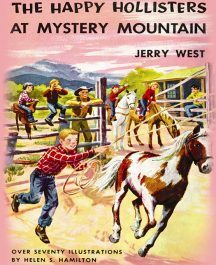 Flickering lights on a mountaintop lure the Happy Hollisters to Nevada to solve a mystery on the Tumbling K Ranch, the home of their friends Bunky and Gina Blair. The mystery deepens when they cross paths with antelope poachers and hear rumors of buried gold, and the Happy Hollisters spend many happy hours on horseback searching for clues to solve all of the mysterious goings-on. GHOST HUNTER WANTED TO RID A HAUNTED HOUSE OF SPOOKS! APPLY MRS. NEELY. THE ANTIQUE HOUSE. Their curiosity aroused over this unusual advertisement, Pete and Pam Hollister visit Mrs. Neeley to apply for the job. 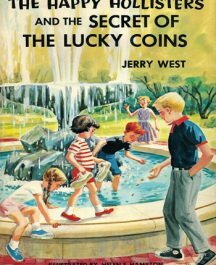 Learn what makes a coin “lucky” in The Happy Hollisters and the Secret of the Lucky Coins by Jerry West. 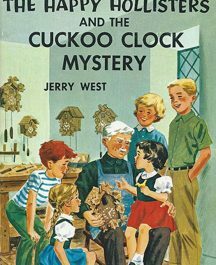 Little Sue Hollister gets a valuable old coin as a reward for a good deed, and the whole family takes up the fascinating hobby of coin collecting. In the tangled roots of an old tree uprooted by a small tornado, Pete finds another rare coin marked with two mysterious clues, leading the children on an exciting and educational treasure hunt that combines coin collecting with botany and forestry. 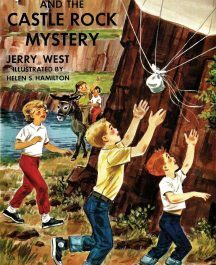 An abandoned rock quarry, mysterious flying objects, and a valuable deposit of titanium lead the five Hollister children — Pete, Pam, Ricky, Holly, and Sue — into their latest thrilling adventure. 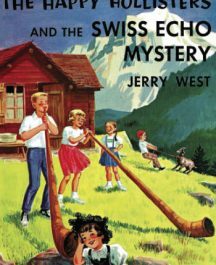 High in the Swiss Alps, a suspicious stranger in a cable car dropped a large black key which the Hollisters found. An insurance investigator named Johann Meyer was following the stranger, an international jewel thief. Mr. Meyer told the Hollisters about his dangerous case—to find a large diamond that had been stolen from Holland. When Mr. Meyer’s small plane was reported missing over the mountains, the Hollisters decided to help. Clue piles on clue as the irrepressible Hollisters track down each new lead, learn about Swiss life and customs, rescue Mr. Meyer, and recover a valuable diamond. One day Pete and Pam Hollister rescued a Seminole Indian named Charlie Tiger Tail from drowning in Pine Lake. But they never dreamed that their heroic act would lead to a new, exciting mystery and a vacation in Florida. 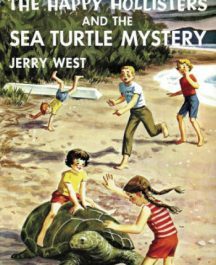 There were many more thrilling adventures—including Ricky’s capture by a gang of thieves who were illegally killing giant sea turtles and stealing their eggs! In this thrilling new adventure, the Happy Hollisters travel to the beautiful land of Italy to help their new friend, Nada Boschi find her Uncle Giovanni, a famous toymaker and puppeteer who has disappeared from his house in Rome. The Happy Hollisters have all kinds of adventures touring many famous places in Italy. 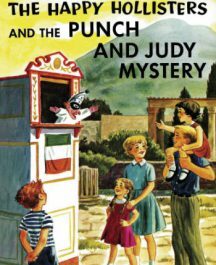 And, before their trip has ended, they not only find Uncle Giovanni but help the Italian police round up a gang of dangerous thieves! 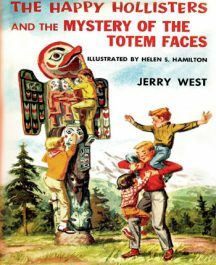 As the Happy Hollisters set out on a trip to historic New England, they learn that masked bandits have stolen almost a million dollars—and a carved wooden Indian has disappeared from a museum in the same town! 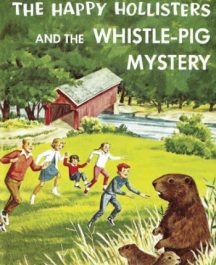 Along the way, the children befriend a family of groundhogs, or “whistle-pigs,” never suspecting that these adorable little creatures will play a part in solving both mysteries. 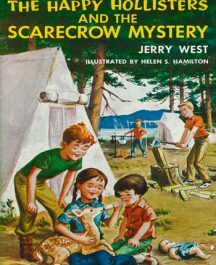 From the moment The Hollister children arrive on Wicket-ee-nock Island with Indy and Emmy Roades, it’s evident that someone doesn’t want them there at all. Prowlers, sabotaged boats, fake telegrams, and ghostly horses all conspire to send them back to Shoreham before they can find a valuable diamond-encrusted coat of arms that is at the heart of the mystery. One million children can't be wrong about what they like. Welcome to The Happy Hollisters! Children love The Happy Hollisters for the excitement and intrigue, but parents and teachers also love them for their carefully detailed educational themes. All major credit/debit cards accepted.